Here, you are able to see the concept of a booth while in the Design and Concept Phase. Here, each of our clients are given a concept of several renderings in order to determine the best design for marketing and sales needs. After a final design is determined, our shop team takes over, manufacturing each item, including electrical, function of moving parts, weight and dimensions for needed storage/set-up/shipment if necessary, best materials for design, etc. Close contact is utmost between the design team and YOU, our customer, to keep your project in budget, within specifics, and delivered on time. 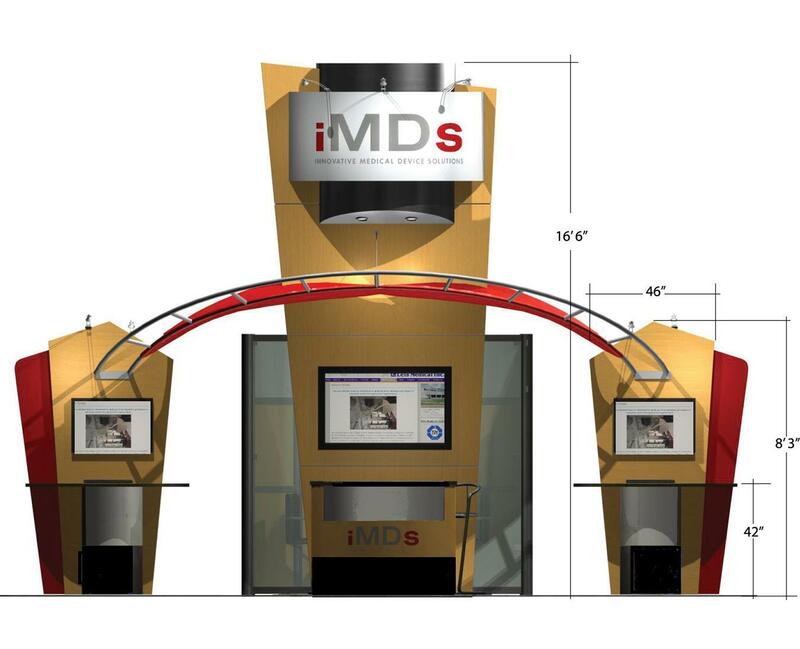 In this case, iMDs has Star Display designing a Trade Show Booth. Not only does this booth design have to show off the client well, but it has to be sturdy, lightweight, easy to assemble, and durable. There are many thoughts and processes behind designing a booth in order to make it the most effective, affordable, and convenient vehicle for the marketing team to sell products and services. Star Display has been designing Trade Show Booths for over 30 years. We pride ourselves in being at the top of our field in Custom Design of these specific and individual customized marketing tools..